www.rockproducts.com ROCK products • NOVEMBER 2014 51 technology could transform the car‐ bon capture industry, noted the com‐ pany. Previously, captured carbon has been sequestered and injected into the ground. Now, using SkyMine tech‐ nology, stationary emitters can con‐ vert greenhouse gasses into common industrial products. "SkyMine is more than a green tech‐ nology – it's a smart business decision that makes money," said Jones. "Our business partners can use this tech‐ nology to meet emissions require‐ ments, replace costly scrubbing tech‐ nologies and increase revenues. 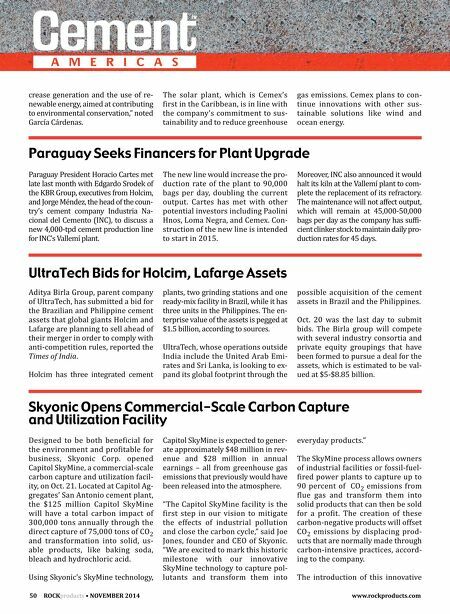 Sky‐ onic is proud to partner with Capitol Aggregates to launch Capitol SkyMine, which will transform greenhouse gases into profits and change the way we all look at emissions." Cementos Argos Releases Positive Third Quarter Results Argos has announced its financial results for the third quarter of 2014. Consolidated income showed an in‐ crease of 16 percent compared to the same period in 2013, with both cement and concrete sales volumes continuing their steady upward trend, with accumulated growth rates of 9 percent and 18 percent, respectively. Performance in the United States continued to show healthy growth dynamics. Dispatched cement and concrete volumes registered up‐ turns of 59 percent and 27 percent, respectively, compared to the same period in the previous year, reaching revenues of more than $804 million, or an increase of 44 percent. The main U.S. markets in which the company is present are Georgia, Florida and Texas, with accumulated year‐to‐date cement consumption growth rates of 24 percent, 22 per‐ cent and 13 percent, respectively, while the average of the North American market as a whole is 8.5 percent. 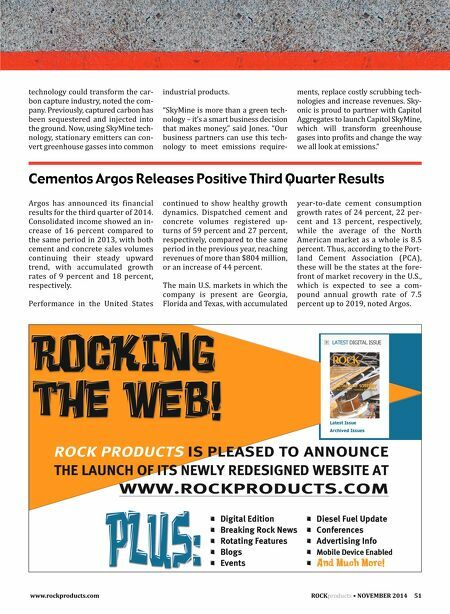 Thus, according to the Port‐ land Cement Association (PCA), these will be the states at the fore‐ front of market recovery in the U.S., which is expected to see a com‐ pound annual growth rate of 7.5 percent up to 2019, noted Argos.